We have a very cushy life, even though we live on a boat. We have apartment-sized furniture and appliances, Iliana has her own bedroom, Rob and I share a queen-sized bed, we have our own shower, and, once they are repaired, we will even have our own laundry facilities. Living on Loco Lobo is a lot like living in a small mobile home. Yet our lifestyle is not without adventure. We lose electricity whenever the tide is too high, which usually happens at least once a year during a storm surge. Last winter we had a deep freeze, which caused us to lose water for many days after the pipes froze. We take these challenges in stride, because they are just a part of living on a boat. However, this Thanksgiving, we had an adventure that was equal parts horrifying, baffling, and, in the end, kind of funny. This story begins with our kitty cat, Popcorn. We rescued Popcorn when she was about 4 weeks old, in the Amish country outside of Mount Pleasant, Michigan. Her mother had been run over, and she was sitting, lost, in the middle of the road. We posted ads, but nobody claimed her. After a few years of being an indoor kitty in Harrison, Michigan, Popcorn joined our family on our move to Texas. A year later, she was living on a sailboat, and we started allowing her to go outside. At first, Popcorn enjoyed hunting. Everyone on the pier loved her, because she killed a large number of wharf rats. Occasionally, she would leave a rat by the door, for her family. Rob tried to humor her, and pretended to eat the rats, but that was not enough. As Popcorn got older, we moved onto Loco Lobo, on the marina’s very laid-back island pier. Everyone adored her and started leaving out snacks for her. A family on a catamaran nicknamed her “Poppy,” and she became somewhat of a celebrity. Our neighbors keep a box with a blanket in it out on their aft deck, so she can come over for a nap and a snack whenever it suits her fancy. Loco Lobo came with a cat hole cut in the companionway door, so Popcorn frequently enjoys going outside. Instead of hunting down rats and bunnies, however, she likes to lie down on the main pier and wait for her admirers to come over the pet her. In the winter, however, there are fewer people staying in the marina. So Popcorn has been keeping herself entertained by playing with the rodents once again. One morning, she surprised us by leaving a litter of dead baby rats on the side deck. More recently, when Rob came home for his lunch break, she had brought in a still-alive rabbit. She had lost interest in it before killing it, so Rob let it go and boarded up the kitty door. The fall is a lovely season in Texas, where we need neither air conditioning nor heat, and we love to leave the companionway door and hatch open most of the time. Our aft deck has doors on the sides, so our dog can’t escape. But Popcorn is nimble enough to come and go as she pleases. We enjoyed a number of pleasant nights, with the boat open as we slept in the fresh, fall air. The first time it happened, Rob noticed a horrible cut on Iliana’s pinky finger, when he woke her up in the morning. There was blood all over her sheets. She had two puncture wounds on the front of her finger, and one in the back. We googled “rats” and learned that rats do not carry rabies, but they can carry other bacterial infections. Iliana had just finished an antibiotic for an ear infection (one of the few antibiotics she is not allergic to), so I continued giving it to her, until we decided what to do. Our boat has a headliner, like a car, for the ceiling. In Ili’s room, it was torn in two places, where she had kicked it from her bed. We in in the process of replacing it. We figured that the creature who bit her, must have come in through the tear, since it was so cold outside. There was no evidence of a rat living in our boat, so we figured that it was a freak incident. We repaired the tear and had Iliana sleep facing the other direction. We all figured that the problem was solved. Until Iliana woke us up at night, screaming. Right next to her eye, she had two deep bites on her face, bleeding a great deal. Horrified, we immediately cleaned it with an antiseptic wipe and gave her a band-aid. She brought her favorite stuffed animals into our bed and fell asleep quickly. In the morning, her face was bruised and swollen. Which meant that whatever bit her was strong. Stronger than a bat, was my immediate thought, because bats are the primary carriers of rabies in our area. That day was Thanksgiving, and we called every urgent care clinic in our area. Nobody was open until Friday. I gave Iliana some antibiotic ointment and another dose of her antibiotic. We allowed Iliana one trip into her bedroom during the day, so she gathered up every single one of her Beanie-Boos. Then we set up rat traps and closed the door. Iliana surrounded herself with Beanie-Boos and fell asleep in the middle of our queen-sized bed. The dog and cat took their usual places at the foot of the bed, leaving Rob and me a miniscule amount of real estate. Which is fine, because I couldn’t sleep. I woke up at night a couple times, and continued researching rats, rabbits, bats, and rabies. Which didn’t make sleeping any easier. What I did learn, is that whatever we did, we had a little bit of time to decide. Urgent care opened at noon, and Iliana had her heart set on shopping at Black Friday. In my minimalist blogging years, I extoled the virtues of Buy Nothing Day and urged my readers to “rethink Christmas.” I encouraged them to make it about more than the mountain of gifts. And then, in the wee hours of the night, I would make sure that Santa delivered a mountain of gifts to our house. Because….Christmas…. Back in those days, I also said that only children were not spoiled. So I was wrong about a lot of things! Grateful that Urgent Care opened so late, and that an animal bite was not an emergency, I excitedly took my only child to Black Friday. We scoured the ads ahead of time, and just ended up overwhelmed by it all. Then I remembered that I had gift cards for Macy’s and Nordstrom’s. I saw that Kohl’s had a sale on toys, so Iliana agreed that we would look for Beanie Boos there, and if they didn’t have any, we would go to Five Below. Together, we eagerly hit the mall! Iliana’s first find was a sequined pillow at Macy’s. She has wanted one for a long time. Before heading to Nordstrom’s, it was time for some Dipping Dots! And, of course, a mirror selfie on our way out. Here is Iliana, all gussied up with her new hair and fashion accessories! We ended the day with a Happy Meal, and got ready for the next leg of our adventure. While Iliana and I were shopping, Rob texted me, saying that he had done some investigating and found lots of rabbit poop throughout the bilge…and a few newly deposited next to the dog food dish. His googling told him that rabbits in the wild are very aggressive and territorial. So it still looked like we were dealing with a non-rabies carrier that was unlikely to spread infection. We made plans to set a live trap, baited with dog food, and after lunch, I took Iliana to Urgent Care. Iliana had a lot of health problems early in life, but, before this year, she had only been to the doctor twice since we moved to Texas in 2013. One of those times was for a check-up and vaccines. When I left my job, Iliana qualified for Medicaid. We have been navigating the bureaucracy of that, trying to figure out how to keep her current doctor (which we likely will be able to do). In the meantime, Iliana has been to Urgent Care twice, with pink eye and with an ear infection. Doctors become very stressed when Iliana needs an antibiotic, because she is already allergic to Penicillin and Clindamyacin. She had a mild reaction to the first one, and a serious reaction to the second. For her ear infection, she was given a Penicillin derivative, which did not cause any problems. That is what I continued giving her, after the bites. So off we were, to our third Urgent Care visit, the day after Thanksgiving. I expected it to be quick, which maybe a Tetanus shot, but not much else. Of course I had to tell the story about how she got bitten by a feral rabbit in our home. I told the story to the receptionist when we checked in. And the nurse who took Ili’s vitals and triaged us. She was very concerned, and said that this sounded like a rabid animal, and we may need to go to the ER. She said she would be right back. Twenty minutes later, we had still not graduated to seeing the doctor. The nurse returned with a map and Mapquest directions to the nearest pediatric ER, which also happened to accept Medicaid. Iliana was very displeased. As we pulled into the hospital parking lot, I reminded her that she used to love going to the hospital. She went there a lot when she was younger, and she would start smiling and laughing when we pulled into the parking lot. She loved the nurses who paid attention to her. I used to joke that she wanted to have her birthday party there. When we lived in Michigan, Iliana had three ER visits and two hospitalizations, all of which she enjoyed. Ili wasn’t buying it. We were scheduled to visit her best friend at 5:00, and Ili remembered how long ER visits often took. It was already 3:00. We were triaged as soon as we walked in, and they directed us to a gurney sitting against the wall (next to pirate decals!) in front of the nurses’ station. I took it as a good sign, that they didn’t expect us to stay long enough to even get a room! He made sure there was no bat evidence in the boat and directed me to keep giving Iliana the antibiotic until it runs out. And he gave us the name of an infectious disease specialist to call if Ili starts having any symptoms, which he said, she likely will not. 10 minutes later, a nurse showed up with our discharge papers, and Iliana and I were on our way! Here she is, ready to visit her bestie! She ripped off her hospital bracelet as soon as we arrived! The year before I got married, I bought a house. It was a 12 X 60 trailer, on an RV lot. I substitute taught and went to college full time, pursuing my teaching degree. Rob repaired cameras. Our budget was tight, and my schedule seemed full. However, overall, that was a very happy time in our lives. We lived there for 3 years, until it was time to “upgrade.” I had completed my Bachelor’s and was teaching full-time and working on my Master’s. I loved my job at that time, and I loved having more time and money, as we lived in the trailer. Iliana was born in a beautiful, grey chalet in a neighborhood in the woods. The house was 1100 square feet. I loved my teaching job, until I didn’t. The teaching profession had been undergoing a number of changes since my first year. Teacher unions were significantly weakened in Michigan, tenure became meaningless, and schools were constantly threatened with serious sanctions if test scores were not high enough. Altogether, this led to a perfect storm of negativity and destruction. When I had been hired, the staff members at my school were tight-knit, and the emphasis was on helping each other. I had a strong relationship with my principal, and I appreciated it when she would give me pointers or redirection. I was not afraid of being called down to the office; in fact, I went down there frequently to ask for her input. I ate lunch in the teachers’ lounge and enjoyed a lot of laughter with my co-workers. This was not the negative stereotype, of teachers gathering to complain about students. Lunch was a fun, positive time. My second year, I was inducted into the Ooga-Booga tribe. The students gathered for an assembly, and all the newer teachers were asked if we wanted to participate. We were led into the gym, by a math teacher dressed up as a cave man-type character. He directed me to lead the students in “We Will Rock You,” and then I was told to sit on a chair…which, of course, had a wet sponge placed on it! This does not mean we didn’t work hard. I taught students with cognitive impairment, and I helped a number of non-readers make significant gains. In fact, there are likely people who are reading this blog, because I taught them to read during that time! My third year, I was attacked by a student, and my shoulder was seriously injured. However, I had the full support of my administration, and we were able to devise a plan to help this student become very successful. He had no more violent incidents after we implemented the plan, and the next year he made all A’s. I often told people that teaching gave me an inner joy. Yes, I complained about the two 30-minute staff meetings/trainings that we had each month, but I honestly loved my job. And it left me with plenty of free time to spend with Rob. One of my friends commented that my job was worth it, because they paid me in days off (even though my monetary pay was relatively low). Like I said, I loved my job, until I didn’t. It happened gradually, but by the time Iliana was born, teaching definitely had a culture of fear. The threat of sanctions–which in Michigan at that time, meant most of the staff being fired and the school being taken over by a charter company–put administration on the edge. Because they were afraid, they targeted teachers who may not be hauling their weight. And the changes to unions and to tenure law, made that course of action easier. Teachers became afraid of being fired, and began to throw each other under the bus. Gone were the days of the fun lounge conversations. I started to eat in my classroom. And there was only one more Ooga-Booga induction, after mine. The demands on our time increased. I would often arrive before the sun came up and return home after sunset. My inability to advocate for myself, led to me being thrown under the bus, repeatedly. I started to dread being called down to the office. I started sailing in the summer. We loved it, and we thought that all of our problems would be solved if we moved to a warmer climate, where we could live aboard full time. And so we moved to Texas, with the intention to eventually live aboard. I made sure I had a job secured first, accepting the first teaching job I was offered. We started out living in an apartment. My first year started out well enough. I received little feedback, but I felt good about what I was doing. Sure, the school day was an hour longer, and we had staff meetings (with no defined ending time) once a week. We had no supply budget. Then, out of nowhere, the calls to the office started. We moved onto a boat, hoping that would fix things. But I was unhappy in my career, yet living on a boat. We moved onto a larger sailboat, and I began to make friends. Things were okay, except for the job. I started to look for a new teaching job, until I was offered a different position within my school. It was okay. There was still a lot of backstabbing, but the calls to the office temporarily stopped. There were even more meetings after school, which I resented. I began to practice yoga, which led me to carve out a space for myself and to begin to process my emotions, regarding my path in life. My yoga practice began to become more important than my job, although I had not considered leaving…yet. But I had begun to make myself and my own needs a priority. We bought a larger boat. It reminded me a lot of our first trailer house. We had tweaked our living space so much, but I was not finding what I wanted to find. I was unhappy. The living space, or the state of residence, was not the issue. I have a Master’s. An MAT, to be exact. Master’s of the Arts in Teaching. I am not trained to be an administrator, nor do I aspire to be one. I am a master of the art of teaching. Yet, for most of my career, I have hated it. Not the teaching, but everything else. The paperwork. The drama. The meetings. The buying of supplies. I was unhappy. I tried having a side hustle. But I did not like the marketing, and I was never good at it. Finally, last year, things got so bad that I left. I considered leaving after the first week of school, and I submitted my resignation, effective at the end of the year, when we came back from Christmas break. And even then, I went on FMLA as soon as there were 12 weeks left in the school year. I was stepping out into the unknown. So here I was, waiting out my contract, looking for employment, with a Master’s degree. I considered tutoring for awhile. I love working with students one-on-one, and I would not be constrained by the standardized tests. However, I would have to either find enough homeschooled students to work with, or work mainly in the evenings. I did not want to spend so much time away from Rob and Ili. I knew that I could look for another full-time teaching position, but I was very hesitant to do that, after having so many bad experiences. So, I returned to my first teaching experience: subbing. I applied in various districts, tracked down references, and signed up for orientations. I am currently substitute teaching in two school districts and at a two-campus charter school. While I had a lot of anxiety when I showed up for that first assignment, I found that a lot of what I thought were my weaknesses, were really just due to being put in impossible situations in my old jobs. I have very good classroom management, when I have support from my administrators, if I should have to seek their assistance. I run a classroom very smoothly, when I have sufficient support staff. And I problem-solve creatively and remain very alert and engaged, when I am not tired and burned out from having to work extra hours in the evenings. As a substitute teacher, I am no longer a part of the rat race. Nobody is trying to “catch” me “being bad” or threaten me with termination. There is a shortage of subs, so I always feel welcome in the building. There isn’t even competition with other subs, because there are plenty of jobs to go around. When I substitute taught in college, I would not know whether I would be working, until I got a call at 5 am that day. Now everything is computerized, so I simply log on the the schools’ websites and choose any available assignments that suit my fancy. I am currently booked through most of November. And there are other perks to my new job, that I did not enjoy when I was teaching full time. I never get bored, because every day is a new adventure. One week, I taught third grade in the morning and high school algebra in the afternoon on Monday. On Tuesday I taught pre-k, and on Wednesday I was an aide in a life skills class. Thursday was my day off, and on Friday I taught a high school business class. I only teach at campuses I like, where I feel supported by the administration and other teachers. I started out working five days a week, but I found that I preferred to have one day off, to work on the house and enjoy some “me” time. At the end of the day, I tidy up the classroom and finish grading any papers from the day. Then I am free to leave. No more indefinitely long staff meetings! My favorite book to read to students! The only downside to substitute teaching is the pay. I make about half of what I made teaching full-time, and I will not be paid over summer vacation and school holidays. However, when I looked at my expenses during my last year of teaching, I was spending about half of my paycheck, just to do my job. I had a longer commute, I was spending about $100 a week on supplies, and I was buying take-out and processed foods because I did not have the time and energy to cook after a long day. We have pared down, streamlined our expenses, and plugged some significant holes in the budget, so that we will not notice a significant difference in our finances, once I start getting full paychecks. I have the potential to no longer be a slave to a paycheck. I have the potential to utilize my strengths and creativity, without being distracted by paperwork, stress, and drama. I have the potential to feed my family and also spend time with them. I have the potential to care for myself, as well as my loved ones. I have the potential to be fully present at my job everyday, and to share my energy and enthusiasm with those around me. This post has been a long time in the making. I turned 40 on September 30, and I wanted to share my celebration at Elijah’s Retreat, in Jacksonville, Texas, with all of you shortly after. However, I have also been getting settled in at my new job and working on balancing work, family, and myself. I am getting there, so today I am writing. Somewhere in our second year living in Texas, I spent a night Googling activities for children with special needs. I had seen a Facebook post about a special needs amusement park in San Antonio, and while I was looking for that, I stumbled across a website for Elijah’s Retreat. This was a resort, located about 3 hours away from us, for autism families. It cost $30 a night and had 3 cabins. Of course I was interested, but I was dismayed to find that the calendar was booked for the next year. I followed Elijah’s on Facebook, and when the calendar for the next year opened up, I jumped on it. Thanksgiving, Christmas, and spring break were full by the time I made my way to the site, but I managed to book two nights on a weekend at the end of summer vacation. That weekend, Rob ended up having to work, so Ili and I headed out on a mother-daughter road trip! Rob had looked over my Jeep, and found it to be in good working order. However, the randomness of life had other plans. As we were approaching Cleveland, Texas, the car started shaking, badly. I pulled into a gas station and noticed a large goiter on one of the tires. I filled it with air and hoped for the best. However, the tire had other plans. We were stranded at the Love’s in Cleveland. I called Rob, who would walk me through a tire change, if I could find a jack. I could not, so I called AAA. While I was waiting, an employee at the store said that his friend could put on a new tire for $120. A bit steep, but that would get us to Elijah’s that night, rather than a hotel. Rob had found a nearby Motel 6, where Ili and I spent the night. She likes hotels, so this was fine. In the morning, we arrived at Walmart as soon as they had opened. The said my Jeep would have a new tire in 30 minutes. Ili and I headed to McDonald’s to eat breakfast, then we returned to Walmart. They were not ready. Two hours later, my Jeep was still up on a hoist. They said that oil changes take priority, and that they would not work on my Jeep as long as there were oil change customers. Rob called, and I loudly explained that I could not take my daughter, who had autism, to an autism resort, because they were holding my car hostage. Before I could finish my conversation, a manager appeared. I hung up, and he apologized. He said I could get my Jeep back right away, with the old tire, or I could wait 15 minutes for a new one. I got the new tire and was on my way. When we arrived at Divine Acres Ranch, Iliana was greeted by a volunteer, who took her on a horseback tour of the property. At the time, the resort was still being run by its founder, Jeff Moore. He was happy to see us, and offered us an extra night, since we arrived a day late. Unfortunately, we both had school on Monday. We had reserved cabin #2, but there was a mix-up, so we stayed in cabin #3, which I refer to as “The Palace.” In the morning, I woke up before Iliana and enjoyed my coffee on the porch swing. I was new in my yoga practice at that time, but during savasana, we were always asked to think of our “happiest place.” To this day, I think of the swing at cabin #3. Iliana had a great time. There was one other family staying in the other two cabins, and their oldest drove Ili around in the barrel train. I called it her “chariot.” We both cried when it was time to leave. We did not take any pictures of our second visit, but we had the resort to ourselves. Elijah’s was struggling financially and in danger of closing. The price increased to $100 a night, but I knew Rob needed to see it. Then, the Torres family purchased the property, and we returned last spring, right after I went on leave from my job. Here I am, on the swing, in my happiest place! Lots of new changes happened with the “changing of the guard.” The price went back down to $30, and the “little ranch hand” program was started. Every morning, Miss Cheryl would drive by with the hay ride, and Iliana could jump on and feed all the animals that morning. She also had the opportunity to ride a pony everyday, mid-afternoon. And while attendance was down, Miss Cheryl’s children would come out to the playground and keep Iliana entertained! 30 pounds less and one year older, I decided to issue in my fourth decade of life, at Elijah’s Retreat! Hanging out and feeding the animals! There was a news crew there that weekend, and here is the segment they aired, which included Iliana! Thank you to to Torres family and everyone else who has kept Elijah’s Retreat alive! We had booked again for Iliana’s 12th birthday. See you there! When you live on a boat, there are milestones that you know are inevitable. You will have pleasant things, like your first long-term cruise, your first time breaking hull speed, your first time partying with total strangers who are now your best friends, your first time seeing the stars without the light pollution of the city, and so on. There are also unfortunate milestones, that come with the boating lifestyle. Your first time running aground. Your first time making port for repairs while taking on water. Your first distress call. Your first small craft advisory. And, if you are living on the ocean, your first hurricane. Rob and I frequently discussed that last inevitability. We decided that it would be ideal if we could experience our first hurricane at our current marina, which is very sheltered. We are on a very sheltered bayou on a lake that feeds into a bay that is part of the Gulf. This would help us to be much more prepared if we encountered one while cruising somewhere else. After talking about it, we decided, as a rule of thumb, that we would definitely stay if the projected wind speed was in the double-digits. If it were in the triple-digits, we would play it by ear. Since we moved to Legend Point, there have been a lot of false alarms. 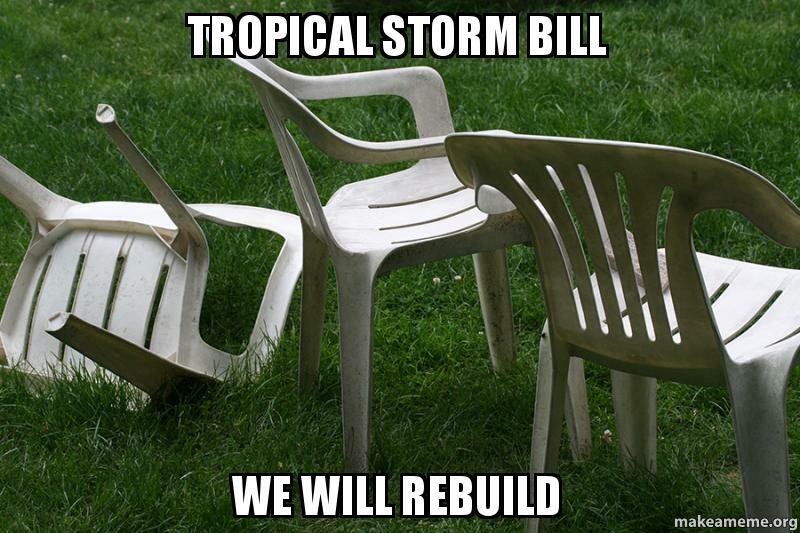 We got all excited about Tropical Storm Bill, which dissapated and was nothing more than some rain and wind. While our friends were visiting from Michigan, everyone was getting panicked about “potential tropical storm Cindy.” People were hunkering down after fighting for the last case of bottled water (yes, there were actual fist fights in stores!). I checked the forecast and assured my friends that this was nothing. Sure enough, it didn’t even rain for an entire day. I was feeling a little cynical as I made my way out to my car for 6 am yoga on August 24 last year, during the suckiest first week of the suckiest school year ever. One of our neighbors asked me if I was worried about the storm. I laughed and said, “There is another one?” He said, “Well….it’s heading for Mexico.” Then he slowed his speech for dramatic effect, “But it might turn.” I laughed and continued on my way. After yoga, I made my commute down the freeway. The signs all read, “Disturbance in the Gulf. Fill your gas tank.” This was unusual, but I was still skeptical. At work, my department chair immediately asked all of us if we were planning on comiMy ng into work the next day. I said I would, as long as I could make it through any flooding. She said she was not planning on coming in. We received an email from district stating that if we stayed home, it would cost us a sick day. At lunch time, the department chair said that it was now a hurricane and they were talking about evacuation. I was still skeptical, because she had alarmist tendencies. Then Rob emailed me and said we needed to prepare that evening. My day ended horribly, with me considering resignation for the first time of many. I got home late, but as I pulled into the marina, I saw a rainbow in the sky. Then my phone gave its notification beep, and I saw that school was cancelled for both Iliana and me. I ran to the boat, excitedly proclaiming that something good had happened in my life! We went to Walmart, with my prepping list that I had written at work. I was thinking bagels, sandwiches, and Mac and Cheese. After everyone had picked through everything, we got gluten-free bagels and bread, fancy organic meat, and Annie’s Mac and Cheese. Fortunately, we had a water tank, so we did not have to fight over bottled water. We waited in line at Spec’s, Texas’s favorite discount liquor store (which was already boarded up, but open and busy! ), and we thought we had enough “hydration” to get us through the storm! The morning of August 25, 2017, Rob and I walked out to the aft deck as soon as we woke up. A very dark, low-lying cloud blew over, and then the sky opened up. It rained the rest of the day. Rob went into work, and I was at home with Iliana. We decided to keep her with us, since my parents were not evacuating. They live in a mobile home on stilts, so we felt better having her on the boat with us, should there be high winds. Yes, we were recently moved onto Loco Lobo, so we had not carpet or wallpaper. Iliana’s room was finished, but the main salon and aft cabin were not. We slept on a Futon. And Popcorn, our cat, was quaranteened to the boat. The power stayed on all day, as the water rose from the storm surge. I knew it would likely be cut at 5, so I washed a load of laundry and cooked a vegan lasagna. By 5:00, I was unable to get off of the boat. After the power was cut, Rob helped me get off the boat for a walk, and then he set up our alcohol stove. I watched the water level throughout the day. The docks went underwater overnight, then the next morning, we got what I called “intermission.” The rain stopped for an entire day.My parents came to pick up Iliana, and Rob and I decided that we really needed to make Harvey Wallbangers. Unfortunately, Spec’s was closed and boarded up, as was every other business in town. We returned to the boat, sure that the worst was over. Before bed, Legend Point lost its first two boats, both unmanned. Obsession was the first, and another followed shortly after. The lake began receding before we went to bed. It was during this time that we committed our first act of piracy on the seas. Our dinghy had sunk, so we had no way to get to shore. Since this was a potentially life-threatening situation, we decided to “borrow” the neighbors’ inflatable boat. Rob put on an orange “camp snoopy” life jacket, jumped into the water, and boarded the neighbors’ boat. He grabbed a large stockpot that happened to be floating by and used that to bail it. We used that boat to get to shore for the rest of the storm. Our dinghy, after we rescued it and dragged it to shore! Rob made breakfast, then while he was at work, I kept myself occupied with cooking! After work, Rob and I decided to walk to docks (he helped me get off the boat!). For the next 3 days, our life was lived on the boat, with a once-daily excursion to shore. We were advised not to walk in the flood water, but the grass was so infested with fire ants, that I always stood in the water while tying up the dinghy. My feet were constantly covered in ant bites, which I lanced with a razor blade in order to stop the incessant itching. Our pier had the only bath house that was not flooded, although it had no power. Using my phone as a light, I took a shower everyday during our shore excursion. The water was nice and hot the first day, but everyday it got colder, until it was just a cold shower by day 5. More boats sunk everyday, all of them unmanned. Altogether, the marina lost 6 boats. We ventured out to our road, which flooded and receded everyday. We didn’t leave the marina, because we didn’t want to be unable to get back to the boat. By day 4, we were getting burned out, and I did what I could to make our lives less miserable. Rob was no longer going into work. Still, we were constantly wet. I tried having one set of clothing that we would wear outside, so that our other outfits would stay dry, indoors, but that never worked. I tried setting up a drying rack in the office area, but in the humidity, only one article of clothing ever “graduated” from it. One thing that wore on everyone was the constant darkness. No matter what time it was, it always looked like dusk. The last time we saw the sun was the morning of day 1, before the clouds rolled in. On day 5, there was a lot of speculation on Facebook. Rumors were flying, that it was going to stop raining that night. My friends in Michigan were insisting that the storm was predicated to come back through, and that we had a lot more rain coming. I turned off my computer and created my own sunshine in my mandala coloring book. By noon, we could see the docks again. But our adventure was far from over. Our power boxes had been submerged, so we were still without electricity. My parents brought us some more batteries and invertors, and our living space looked very post-apocalyptic. Rob was going back into work, and working extra hours to repair the damage. He would bring a battery or two with him and charge it while he worked. One of my friends let us borrow her Yeti cooler, which was wonderful! Stores were beginning to open, with police officers at the doors, allowing a limited number of people to go in at a time. There were long lines waiting to get in. I was glad we were so well-provisioned, so that I could avoid this. Two days after the storm ended, we had a yoga class. The studio had flooded a little, but there was not a lot of damage. With fans running to help things dry out, Cass led us through a restorative class. It was a wonderful piece of normalcy. Friends wanted to know how they could help, and I said that meals would be wonderful, since our cooking options were limited. We were also unable to do laundry, since we had no electricity and the marina’s laundry machines had been ruined in the flooding. Various friends helped me with that, and I even enjoyed an actual hot shower while doing my laundry at one friend’s house! By the weekend, we needed a break. On Priceline, I found a great deal at the local Extended Stay America hotel. It may as well have been the Hilton! We watched a Harry Potter marathon that weekend, which seemed to be especially fitting. Back on the boat, the lack of air conditioning was definitely adding to the misery level. It had not been hot during the storm, but afterward it was back to typical Texas August temperatures. One day, I was determined to help someone who had been flooded out. I needed the diversion…and the a/c! Cass, my yoga teacher, had posted on Facebook that her son’s house had been flooded, and people were asking if they could help. She posted the address, and Iliana and I made a beeline over there! I was rewarded with air conditioning and was more than happy to help clean up sheetrock, while Iliana played with the kids. School was cancelled the next week, but a martial arts studio held an extended day camp. This gave Iliana some structure and got her out of the heat. I was glad I had obeyed the highway signs and filled my gas tank, because it was a week before any gasoline was available. The stores, which no longer had police acting as “bouncers,” were very poorly stocked. Then, finally, on September 11, it was time to go back to school. Going back to work meant that I could do my laundry before school, in the machines in one of the classrooms. I also kept water bottles in the freezer at work, so that I could bring them home and have cold water to drink. I had to hurry home everyday, because Rob was working long hours, putting the marina back together. After 19 days without power, he finished single-handedly repairing the electrical system. September has always been my January. One of my favorite aspects of teaching was that every fall was a fresh start. No matter what had happened the previous year, September was a time to hit the reset button and begin anew. I made resolutions–both personally and professionally–every fall. So you can imagine the roller coaster of emotions that I have experienced this fall, since I am not returning to a classroom. There has been grief over losing a huge part of my identity, guilt over the way things ended, fear about my next steps, and exhileration and optimism about my new direction! The past few days, however, have been all about Iliana. Last year was rough for her, with the hurricane interrupting things, me being gone until after she was in bed in the beginning, then me not going to work in the spring. She was not looking forward to going back, so we have been working on putting a positive spin on things. We began with a favorite tradition from my school days–a trip to the mall! Of course, multiple trips on the escalator were involved. Ili has a sizable wardrobe on hand-me-downs and thrift store clothing, but for her “opening day” outfit, we actually went to the Gap. This was a new experience for me as well, since I have never been to the Gap! You will see what’s in the bag later! Then it was time for Dippin’ Dots! Next, we were off to Claire’s to find that perfect accessory for Meet the Teachers night! Unimpressed with the overpriced school supplies at the mall, we headed to Five Below to pick up a binder and some stickers to decorate it with. Then, it was time for Meet the Teachers night! That is Ms. Gomez, Ili’s favorite parapro, in the middle picture. After meeting her new teachers and reconnecting with all of her friends, we met up with Jocelyn and Ava for some end-of-summer fun at the Kemah boardwalk. Because when you live within walking distance of an amusement park, you have to go there! And finally, this morning, it was time for Iliana’s first day as a fifth grader! With her new outfit and Undertale backpack, she was ready to go. Iliana found ways to pass the time. …Which, of course, meant that the bus pulled in during my call! Iliana had a great first day of school, and she loved being in the highest grade on campus! Do you have a little one heading back to school this fall? How was your first day?